In a very large skillet heat oil over medium heat. Add chicken; brown chicken on all sides, turning to brown evenly. Remove chicken, reserving drippings in skillet. Set chicken aside. Add mushrooms, onion, and garlic to drippings in skillet. Cook and stir about 5 minutes or just until vegetables are tender. Return chicken to skillet. In a medium bowl combine undrained tomatoes, tomato paste, dry white wine, Italian seasoning, salt, and pepper. Pour over chicken in skillet. Bring to boiling; reduce heat. Cover and simmer for 30 to 35 minutes or until chicken is no longer pink (170° F), turning once during cooking. Serve over hot cooked pasta. Sprinkle with basil. 91% less sat fat • 51% less sodium than the original recipe. 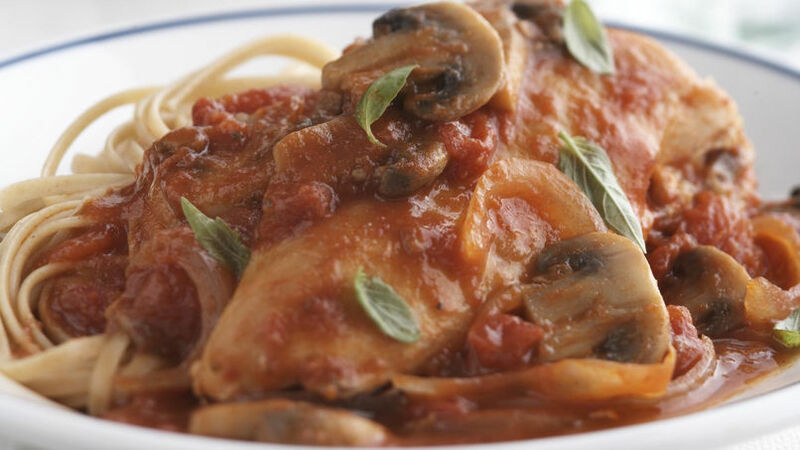 This juicy chicken, hearty sauce and delicious pasta will be a hit with even the pickiest eaters in your family.